The A-7 supporting platform is compact, stable and safe with guardrail and ladder. 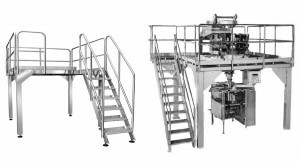 The platform is mainly used to support the multihead weight filler. Also can be use support hoppers or other type fillers under packaging machine. Platform made at highly sanitary design with full stainless steel structure#304 Easy cleaning and assemble.